Australia is weird when it comes to premieres. Sure, Sydney had one a short time ago for Tomorrow When The War Began. But since then, there's also been a premiere in a little known area of the Gold Coast called Robina, and this time? A suburb of Sydney called Parramatta. Fortunately, it's within driving distance, and fortunately it was on a weekend. They even had a decent coffee place, so what was I waiting for? Other than the sound of teenage girls screaming, I mean?? I return, and find that things are starting To Get Real. As in... a security guard with a water sprayer? That's... not a lot of deterrent given the kind of crazed fan I'm already seeing. Praying for Efron, I'm guessing? Awesome. I hear he's totally coming. The crowd? Is building. And Zac Efron? Will totally respect the traffic signs in your country. "He's going to be standing right here and I'm like gonna sqeeee and ask him to marry me like 4EVA..." It's every girl's dream, I hear. Ummmm.... awesome? I literally have no way whatsoever to engage with people who bring crumpled Zac Efron posters to a premiere even though they're unlikely to get within 20 metres of the guy. "Did anyone say 'free t-shirt'??" I don't know who any of these people are, but the two on the left introduced themselves as being from radio station 2DayFM. There's some great expressions on the faces of a photgrapher and a reporter. Given she's female, she's probably memorising her marriage proposal to The Efron. His expression more closely matches mine at this point. "Will you.... uh.... uh.... squeeeeeee????". I suspect Zac Efron gets a lot of this sort of thing. He seems to vaguely recall he still owes me $5 from last time? Excellent. Pay up, Efron. ... and here we have our second. "Could you sign something... anything.... for my daughter... PLEASE? Here, sign my cameraman!!!" Channel 10's entertainment powerbroker Angela Bishop interviews The Efron (hopefully reminding him about my five dollars) while stablemate Richard Wilkins lounges coolly in the background. Dare I even speculate as to what question Ms Maxwell asked The Efron?? So.... finally I get my second Aussie premiere to add to the very London-centric "archive of stuff I've photographed" . Actually, I note that I've photographed Mr Efron twice before, once for "17 Again" and once for "Me and Orson Welles". A premiere! In Sydney! UNBELIEVABLE. I haven't done one of these in over four months... and given Sydney is many things (including "Not London") it'll likely be some time before I get another one. Time to make some hay while the photographic sun shines... and I was so 'desperate' to do this premiere, that even though I was committed to the 14km fun run "City to Surf" I brought my camera and lenses into town and headed back in from Bondi, still hot and sweaty (but suitably attired) from my athletic exertions, and did it anyway. Here's how it (surprisingly) went down. Right about here is where I'd be expecting a dude with a Yellow Cap to be standing. However, that was another time and another place. Damnit, and I'd only just left the Pulsar there for a couple of minutes.. They've got a list! It was quite sizeable, and the corps of media photographers were slightly more than half a dozen. Not too shabby? Maybe this is R-Patz working undercover to earn some extra dollars and get away from the screaming girls. "Tom, I'm standing here with less than an hour to go til the cast arrives, and all I can report are that these really are some odd shoulderpads. Back to you in the studio..."
The haircut on the guy is surely a glorious thing. I have no idea who he is, but I'll be able to recall his hair later if it's in a lineup it's so awesome. Problem is, over time in London I at least got a passing knowledge of who some of the more famous socialites, wives-of-footballers and low-level royalty and TV stars were. Here in Australia, I simply have no idea AT ALL..
Take this trio. They could be anyone. They could be the Australian equivalent of the Jonas Brothers for all I know. Of course, it would be highly unlikely that I wouldn't recognise Australia's reigning Miss Universe Australia... Miss Rachael Finch! "I'm just going to fiddle prettily with my hair for a little bit and loo all cute doing so, if that's okay". It's working. I don't know who this is, but I'm going to hazard a guess and say he won't be fiddling prettily with his hair any more than I will. Whereas this may or may not be Susan Sarandon, who is not in this film and likely has no reason to be in the country. I'd like to think people from the actual CAST might eventually show up to this thing... but then again my last premiere before this one was back in London for "The Shouting Men" and that assumption proved unfulfilled. This? Is a lady in a hat. Being photographed. That's all I know. This is the director, Stuart Beattie. His little son was also on the red carpet, signing autographs because his dad is famous. HOLY FARQ : he was the writer of 2009's "GI Joe : The Rise of Cobra"!!! ...Oh. He knows. He just doesn't care. Actress Phoebe Tonkin has been on two episodes of something called 'Packed to the Rafters' and 78 episodes of something else called 'H2O' which I've never heard of. Still, she's pretty enough that I'm not excessively fussed that I know nothing about the guy she's with who is also in the film. A sizeable portion of the young-ish cast arranged around the director. The premiere was an indoor one, and I kind of feel I should give props to the organisers - Leicester Square in London is made for these things.. while George Street in Sydney is like a main road, so this one had cars stopping on a busy road, and then entering a cinema that was shared with regular cinema patrons, media, fans, attendees _and_ diners at Subway, Burger King and Easy Way. And nobody rioted or anything! Author John Marsden (who wrote the books) is wondering how many liberties with the laws of physics Stuart Beattie might have taken in this film. Either Deniz Akdeniz or Masa Yamaguchi, I presume? "I forgot to buy a choc-top. Can I go back?" I'm sitting here in 2014 having never actually done a journal for this premiere, which I went to a mere four (4) days before heading off skiing, then taking a month off to travel around Europe before taking another month off to travel around Japan before moving back to Australia. There is a reason why, no matter how bad my memories of the Alice In Wonderland premiere were, I didn't really feel like dignifying this premiere with the status of "my last ever premiere" because (a) it was a movie about soccer, (b) that I'd never heard of, (c) attended by nobody I'd ever heard of, (d) for a film that I've never heard anything about since its premiere (I just checked its imdb score... 4.9!)... 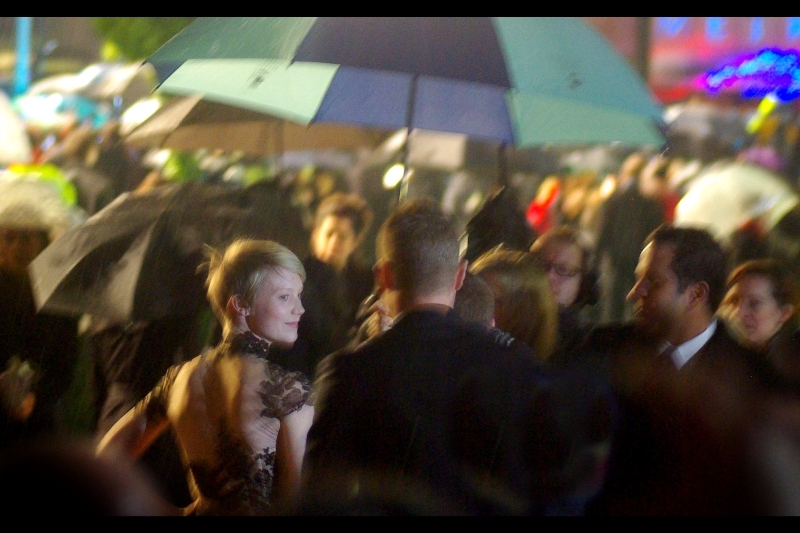 and then within five months I actually WAS at a premiere... in Sydney, Australia, that blew this one out of the water. But I can look back at it now with a little fleeting fondness, and revisit it, and edit the photos for the first time (without using photoshops to straighten horizons, even)... and create that missing journal. "She be a fine carpet. I say we don't let a soul walk upon her..."
Can't tell if famous, but walking on carpet means you've got access (unless security charge and crash-tackle you). This? Wireimage informs me is P.H.Moriarty, and PJ Moriarty? imdb informs me, is an actor who has had roles in such diverse films as Lock, Stock & Two Smoking Barrels and Jaws 3-D... well... wow. All these years I'd assumed he'd been a player for Gillingham FC, the club whose fans the movie is about. Much more exciting (perhaps) than him not being a football / soccer player OR in this movie for which he's attending the premiere... wikipedia doesn't actually tell you what the letters "P" and "H" in "P.H.Moriarty" stand for... and imdb will only provide that the "P" is for "Patrick". So... any guesses as to the "H"? I refuse to do any research on this, as the solving of the mystery will remove 'the magic'. We now move on to the random 'we're here to entertain you as part of the promotion activity for this film' segment of the premiere. I already pre-emptively miss DJ Impact, who will show up later in these journals as a rapper/emcee whose job it is to hype up the crowds at premieres. Still.. soccerball juggling beats.... staring at a bit of uncarpeted ground for ten minutes.... I guess. I've crushed that composition if I do say so myself, and in addition to this, wikipedia reveals that SIR Geoffrey Hurst is a former soccer player who remains the only person to score a Hat-Trick in a world cup final, doing so in England's 1966 victory over West Germany. That makes him a pretty big deal, then... however I'm both just German-born enough to be kind of 'meh'... and very much Australian-enough to both (a) insist on calling the sport 'soccer' and (b) not caring overmuch. Still... well played (44 years ago), Sir (SIR). I think you'll acknowledge that it's highly necessary for me to fulfill my 'minimum one female quotient' requirement I just initiated... and I'm pretty confident that this is one. Wireimage identifies her as Lara Lewington, and that's really all I need at this point. Please don't get briefly excited and then disappointed when I note that this attendee is positively identified as "Billy Murray". That's... BILLY MURRAY, not the more famous BILL MURRAY, who was in Ghostbusters and The Fantastic Mr Fox. I'm actually mildly impressed that beyond the soccer-skillz dudez from above, there was actually a secondary promotional element to this premiere : girls with Wicked Witch Of The East socks and tops with "The Shouting Men" printed on them. It's the third thing I noticed after the Ben&Jerry and Pepsi signs.. but then I'm not that observant. And so... for the first time EVER, this premiere is acknowledged and WILL be part of the Archive of Movie Premieres, complete with a link. After THE BAFTAs on Sunday, there was still one more BIG premiere to look forward to: the World Premiere for ‘Alice in Wonderland’, directed by Tim Burton. With Johnny Depp expected AND Royalty expected AND rain expected AND crowds expected AND the pressure of it being more or less my last big hurrah in Leicester Square, this was always going to be a tough ask. I’d dropped by at lunchtime to see how the crowd situation was shaping up, and it was about as you'd expect for a Royal World Premiere. Specifically not good for anyone still needing to do another three or four hours in the office before being able to try to find a place (eek!). And Yellow Cap Guy, sadly, was not there at all. Ominous. Several hours later, and we begin, with me about six rows back on a stool (since banned) that can clear heads and handheld cameras but not umbrellas.... the premiere begins..
.And here's Tim Burton, one of those directors where no matter how freaky the movie is, you really have nobody to blame but yourself if you don’t like it. For every Batman there’s a Mars Attacks, and for every Edward Scissorhands there’s a Planet of the Apes remake. Visually, though, you're guaranteed a quirky ol' time. Helena Bonham-Carter plays the Red Queen in the film. I just watched the trailer and … yeah… she really did shave off her eyebrows for the role! But I'm hoping the flamingoes she plays croquet with were suitably tranquilised. Otherwise that would just be cruel. Pentax autofocus? Fail = epic! Oh well, it’s not like Anne Hathaway pretty or anything.…. …Oh wait. I’m thinking of Steve Hathaway, a truck driver from Norfolk. Yeah, Anne Hathaway is fairly pretty. Also... rain, huh? And then Johnny Depp arrived, and my camera (which I’m now *certain* is female) got so excited that she/it totally forgot that she/it can shoot at three frames per second, instead settling for a more devastating… one per second. But feel free to console yourself with a couple of Johnny Depp photos taken last year's premiere of "Public Enemies"
If you're a guy who hasn't seen The Devil Wears Prada, it bears a striking similarity to Star Wars in some ways... or from a certain point of view. "Tim Burton also directed a Planet of the Apes film??" I promise you that if Tim Burton had lingered longer, and Helena Bonham Carter hadn't done her interviews blocked by aides and hangers on, and Mia Wasikowski hadn't arrived later and if Johnny Depp wasn't over there... like... _somewhere_ (points), I'd be posting at lot less photos of Anne Hathaway. (Well... maybe. Have you *SEEN* her recent(sh) GQ cover shot??). Comedian Matt Lucas plays either Tweedledee or Tweedledum in the film (or both, perhaps – it’s the digital age of cinema, did you know?). I know little about him, but since he did block (yet more!) views of Anne Hathaway, all I can say definitely is that he's not transparent. For no readily apparent reason, former teen singing-sensation and now twentysomething singer Avril Levigne showed up, standing exactly where you might have wanted Johnny Depp to stand earlier. (Come baaaack!). Actress Mia Wasikowska plays ‘Alice’ in the film. She’s Australian, and…. what, you couldn’t tell by the name? By this time, feeling both wet and despondent, I decided I didn't feel like staying for Prince Charles, so I headed off, but in shifting locations I missed some other stars (d'oh!) and had no way to recover. It goes to the top of "The Archive of Movie Premieres"
And, until (one perhaps last) next time!